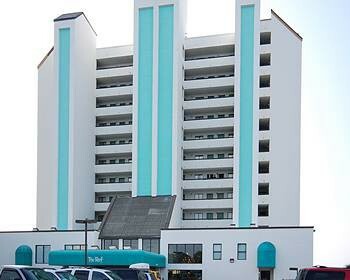 Property Location With a stay at The Reef at South Beach in Myrtle Beach, you&apos;ll be on the beach and minutes from Midway Park, and close to Art Museum of Myrtle Beach. This beach hotel is within close proximity of Family Kingdom Amusement Park and The Market Common.Rooms Make yourself at home in one of the 124 air-conditioned rooms featuring refrigerators and microwaves. Rooms have private balconies. Complimentary wireless Internet access keeps you connected, and cable programming is available for your entertainment. Bathrooms have shower/tub combinations and hair dryers.Rec, Spa, Premium Amenities Enjoy a range of recreational amenities, including an indoor pool, a spa tub, and a sauna. Additional amenities include complimentary wireless Internet access, an arcade/game room, and a picnic area.Dining Enjoy a satisfying meal at a restaurant serving guests of The Reef at South Beach.Business, Other Amenities Featured amenities include a 24-hour front desk, laundry facilities, and an elevator (lift). Limited parking is available onsite.